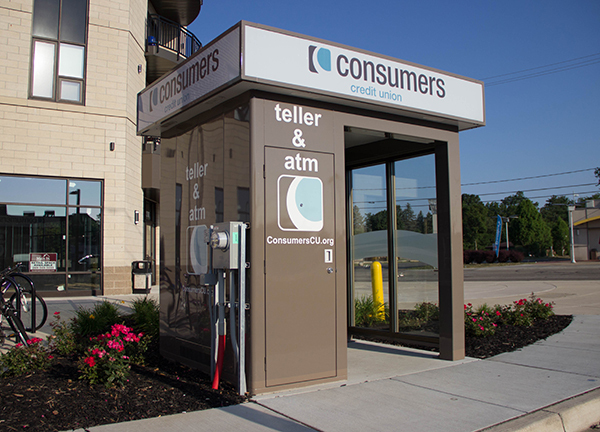 Consumers Credit Union has opened our first freestanding, walk-up Interactive Teller at the corner of Howard and West Michigan Avenue. Just off Western Michigan University’s campus, it’s within easy walking distance of the campus and other student favorites, including many popular off-campus living areas. Our Interactive Tellers are a video-linked teller and ATM rolled into one. You can use the basic ATM function 24/7, or if you need to make a more complicated transaction, a real, live person sitting in Kalamazoo will help you. Our Interactive Tellers can handle just about any regular banking transaction you might need, including deposits, loan payments, transfers, transaction histories and cash in variable denominations ($1s, $5s, $20s and $100s). The newest walk-up version of our Interactive Teller offers the same convenient extended service hours as our drive-thru versions: Monday through Fridays until 7:00 p.m. and Saturdays until 1:00 p.m.